I've recently been drawn to researching various photographers in addition to the subjects whose images they captured. I don't know who the man in this photo is. There are no identifying markings on the back. The bottom corner identifies the origin of the photo as Baker Studio on 39 Monroe Ave. in Detroit. 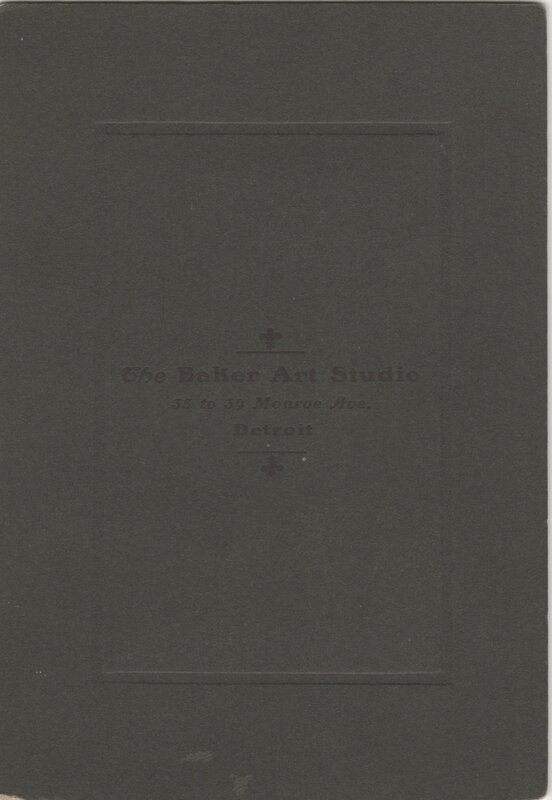 The back elaborates further and says the photos is from "The Baker Art Studio, 35-39 Monroe Ave." also in Detroit. There are indeed several newspaper advertisements in the Detroit Free Press around this time that (late 1800s to early 1900s) that confirm a Baker photography studio was at this location. Though it does not mention Baker, this ad from 1882 mentions "The Photographers" at the same address. There are also several smaller ads that do mention the Baker name. Like this one advertising for a "good sized errand boy". Or this one looking for a "thoroughly experienced reception room lady". "As early as 1875, Charles was involved in the photography business in Detroit with his beginning efforts under the proprietor, Corydon C. Randall, whose photo studio was located at 220 Woodward Avenue. He also worked for a time with photographer Joseph E. Watson on Monroe Street at the very locations where in 1884 he would begin using his name in the Detroit City Directories under the list of photographers. His career continued at various locations and in different capacities that included commercial photography into the early 1920s." So, though I haven't a clue who the man in the photograph above is, I now know a lot more about the photographer who took his picture. Older PostMystery 16 Month Marriage of Porter Dean Sears (1906-1935) Ends in Divorce Due to "Repeated and Extreme Cruelty"